One of the most important things to remember for artists wishing to create work for public spaces is to read the Call for Artists very carefully to be sure you really want to and can deliver on their requirements within the budget and timeline given. Start with a small budget if you have no experience as there is less competition from the Big Players who want larger work. An Art Commission is more likely to give an inexperienced artist a chance on a smaller project. You can then work your way up to projects with larger budgets requiring more experience. A Request for Proposal (RFP) and a Request for Qualifications (RFQ) are different types of applications. An RFP usually requires the artist to submit the typical letter of interest, artist statement, resumé, and images, as well as an actual detailed proposal for the project. The Commission then chooses the artist whose proposal they like the most. This process saves the Art Commission time since they see what the artist plans to do from the very first. However, it requires all the artists to spend time, effort and even money (if they make a maquette, for example) without any guarantee of payment. Most of us don’t like working for free. The RFQ process is more lengthy for everyone. Artists submit the standard letter of interest, artist statement, resumé, and images. The artist’s past work speaks for itself and the Commission has an idea of what style to expect. Then usually 2 or 3 finalists are chosen from these applicants. These finalists are paid a stipend (usually a percentage of the total budget) to travel to an interview with the Commission to present their proposal. One project is chosen and the rest of the process is the same as for an RFP. Since this process takes longer, I think the Commission learns a lot more about each finalist and has a better idea of what working with that artist will be like. And it is clearly more fair for the artists, something the Commission can be proud of. Artists also benefit from the longer process in another way: they can learn a great deal about how smoothly a project will go by how smoothly the Commission completes its initial steps. Do they communicate clearly and keep their own deadlines? Do they keep changing things or ignoring your requests? Sometimes their process is just so slow, changeable or unclear that it is best to politely decline their offer to work with them. It’s better to bow out before a project begins than to get stuck in a broken process. As a beginner you may choose to spend the time and energy on an RFP with the hopes of getting started. But as artists accumulate more success in public art projects, we tend to limit our applications to RFQs. Whichever type you are applying for, it is always very time-consuming to make a great application. Meeting the criteria and answering the questions accurately and completely is very important. This part of the process gives the Art Commission a good idea of what they might expect while working with you on the actual project. I keep a folder on my computer with the standard information in it, updated regularly, and revise it to meet the specific criteria of each call: letters of interest, resumé, artist statement, images, and an image description list. Having this all in one place saves me a lot of time and helps me present my team as organized and responsible, as well as creative and proficient. Hiring trailers and cranes to help install your work is costly and nerve-wracking. Glass artist Lin McJunkin says her heart stops every time she sees the pieces she creates with metal sculptor Milo White dangling in the air like this! But knowing that Milo is extremely accurate in his specifications to the contractor is reassuring. This piece fit perfectly over every one of the 16 bolts embedded in the concrete pad, amazing everyone from the crane operator to the engineer and the Commission. This level of accuracy and attention to detail is how they win repeat clients as well as new ones. Check to see who pays for what part of the process. Make sure you do your research on the budget and include around 10% for unforeseen problems. Site preparation, delivering the sculpture and the actual Installations can be very expensive, so take that into consideration if the installation is something the artist is expected to pay for. There’s a saying that, “Your first public art piece is paying tuition = you lose money but that’s okay because you have to get started somehow. On your second public art piece, you should break even = you are learning. And you should finally make money on your third public art piece.” Maybe you can speed this process up, but I found it to be fairly accurate. Notice who retains the Intellectual Property Rights to the work and under what circumstances the work can be reproduced in print or digital form. Are there royalties to be paid for the use of your image? Be sure the City grants you full attribution on all materials related to the work by stating your name and title of the artwork. And be aware of how the contract can be terminated by either party. Once you have a signed contract, make a CHECKLIST with all the items to be completed, by what date, and by whom. Some entities do this for you, but usually you have to glean them from the contract itself. Make a calendar for your project and work backwards from the due date to schedule your process to be sure you finish on time. Keep in mind that everyone you work with has their own deadlines, distractions and personal issues that may not meet your timeline. Your emergency is not their problem. Weather can be a big factor as well. I usually try to avoid installations in winter (think heavy rains, snow, etc.). Frozen fingers don’t work well on large metal wrenches. Finally, communication with the Project Director and everyone else on the project is crucial. Keep them posted on your progress, invite them to see the process in your studio, ask questions and use their experts. Most cities are eager to help. In this way, you can make the process of completing a public work of art as meaningful as the product itself. My team prides itself on creating a positive and enjoyable process with cities and Art Commissions, in addition to fabricating a technically proficient and socially significant sculpture. And you can too, if you follow these steps. The first time I create a new sculpture I think of it as a loss leader. I don’t plan on making money on my first one, I only try to learn from the experience. If I get a chance to make another one I will have a chance to refine the design and price it at a point that reflects time and materials better. For me the most important aspect of creating and selling large art is to understand the self-sufficiency of your customer. You have to have a realistic expectation of what your customer is going to expect from you on the day of the installation, a year down the road as well as many years down the road. I did not anticipate 20 years ago how much of my business would be assisting my customers in moving their sculptures safely. Complete, detailed instructions are provided for the installation of each style of sculpture I create. I only have problems when people ignore these instructions and use a temporary solution like a wooden base. 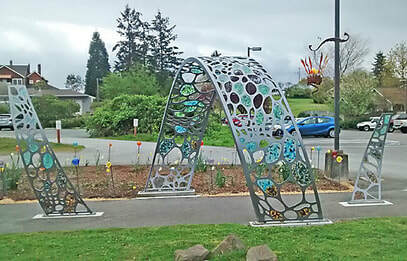 You can find an Andrew Carson sculpture by the SW corner of the zoo in Seattle. There's also one across the street from the Amazon spheres but you have to look up 6 floors. There are many more scattered around the NW: look for his distinctive metal tag on the pole. I try to design my sculptures so only small and inexpensive items can be broken, especially if the piece will be in a public space. This way if glass is broken in transit or during installation I can easily send a replacement. 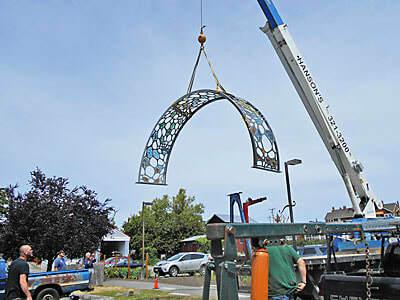 If something breaks on the sculpture after installation, there is less chance of anyone being hurt if the breakable pieces are small. Customers who are either handy or have the funds to hire a competent handy man are easier to work with in the long run. I always have the end user in mind when I create my pieces. Are they self-sufficient, will the sculpture be placed in a private or public setting etc… This way I can avoid problems down the road and concentrate on creating new and interesting pieces. Want to commission a public art project? Here's a step by step Public Art Roadmap for Seattle neighborhoods wanting to commission art. Your community probably does something similar. More help: Artist Trust is is a non-governmental organization which maintains a long list of calls for art and offers many classes, grants, and other resources for Washington artists. Their annual GAP grant application process opens at the end of April. 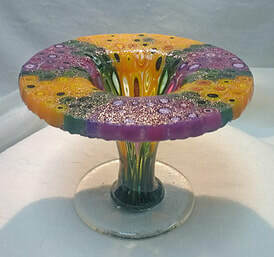 If you need access to special equipment (a bigger kiln or time in a glass blowing studio) or maybe just someone more experienced to talk to, you might check with Schack Art Center in Everett WA, Pratt Art Center in Seattle, Bullseye Projects in Portland OR or take a look at our resources page and get to know the folks in your area. 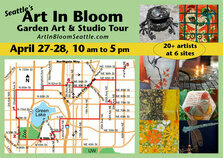 Connie Munford will host site 6 on the ArtInBloomSeattle.com garden art and studio tour April 27-28 and will have colorful garden art like this new fused garden stake. 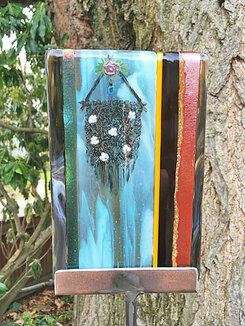 Athena Hornsby, owner of NW Garden Bling, just got back from the annual Glass Craft and Bead Expo in Las Vegas where she made this murrine drop vase. She reminds folks to drop by her shop in Concrete WA for the Spring Fling May 3-14. 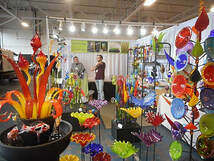 "Glass Expo was explosively celebrating its 25th anniversary. Lots of awesome classes, many taught by Northwest artists. 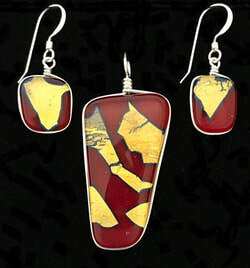 Everything was on the slate for classes from mosaic and stained glass to new fusing techniques with twists. The show was great, with some new unique equipment on display. 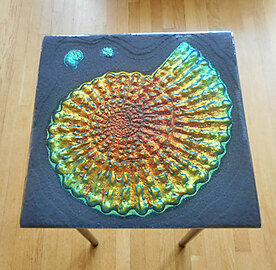 Techiniglass has a new grinder and I really loved the large work surface (12" x 16"). Also appreciated that the backsplash allowed large glass pieces to move through for continuous grinding. Great to see Matt, Missy and Dave representing NW Art Glass and the NW in general. Reminds people what a glass mecca the PNW is." Watch as glass blower Andy Nichols installs his 27 ft long Salmon Swimming Upstream at the Columbia Gorge Community College in Readiness Center, The Dalles, OR. 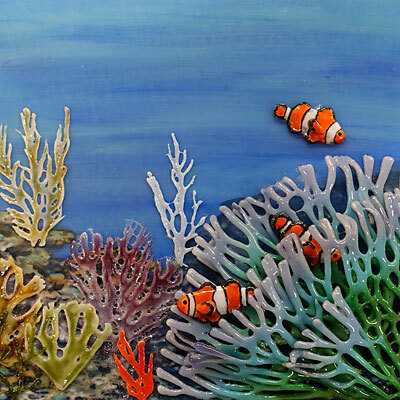 Andy writes: "Being a glass artist in the Columbia River Gorge that focuses on NW fish I found this opportunity a good fit. The Readiness Center in The Dalles, OR was looking for art that reflected its area and culture. The Salmon have been a huge part of this area for its people for thousands of years, and the fish endure an incredible life cycle." Looking for other glass folks? Your favorite glassy event isn't here? Send us a note or post it to our moderated Facebook page. We've simplified the Classes/Resources page. If you offer classes (or want to help someone who does) please see if I have you listed/linked correctly. If you have a specific class coming up please post it to our moderated Facebook page. You sell/teach glass art and you're not in our Gallery? It's free. Without you and your other glass friends our database isn't nearly as useful to the the Pacific NW glass community. We want a photo of yourself at work for the artist directory and 3 images of your art for the gallery plus a bit more info so prospective buyers, galleries, students, and others can contact you.